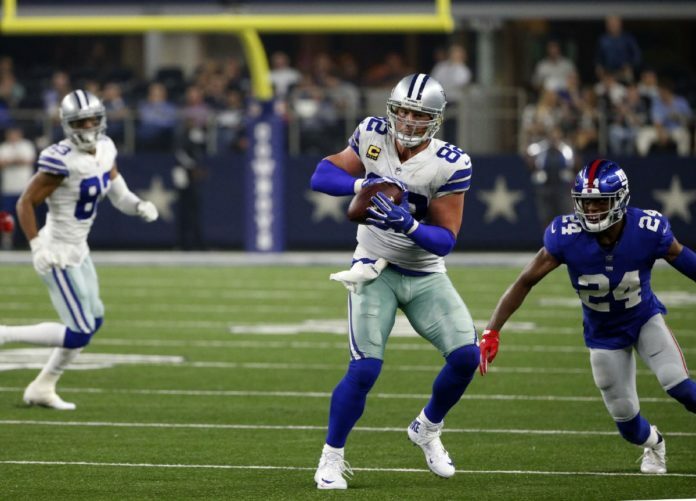 During an interview about becoming the new Cowboys all-time leading receiver, tight end Jason Witten moved the spotlight from him to the who that have pushed him forward. Witten’s catch and touchdown against the Giants put him at a total of 11,906 receiving yards in his career, according to the NFL. The previous record of 11,904 yards was set by Michael Irvin, who played wide receiver from 1988 to 1999. By the end of Sunday’s game, Witten was up to 11,947 yards. Although he was surpassed, Irvin immediately reacted to the breakthrough on Twitter with nothing but excitement. Witten also received recognition from Drew Pearson, another wide receiver from the 70s and early 80s. Behind Witten, Irvin, and Tony Hill, Pearson is fourth on the list with 7,822 yards. This is not Witten’s first time at the top of his team’s list. Since being signed in 2003, the career Cowboy has played 224 games in 15 seasons —tied with Ed “Too Tall” Jones from the 70s and 80s for most games played with Dallas. This achievement seemed to have a bigger impact, especially on Cowboys owner Jerry Jones. Beasley said any rookie looking for a role model in the NFL should simply look at Witten. Despite all the praise, Witten appears to remain humble.